Yeah, yeah, yeah. We all know St. Augustine is old. The area surrounding the modern city was first explored in 1513 and it’s grown ever since. But 15 years later, Panfilo de Narvaez arrived in St. Marks, on the Big Bend, with 300 men. What followed there, at the confluence of the St. Marks and Wakulla rivers, were a fort, a fishing village and a not-so-deep-water port. And, of importance to anglers, the then-rugged shoreline to the east has remained virtually untouched for almost 500 years! Inshore fishing at the mouth of the St. Marks River is easy, fun, and often productive! For the sake of your outboard’s lower unit and prop, I’ll give you the details of getting to some great spots for the seatrout, reds and pelagics you’re likely to find here this month. From those points to shore, you’re on you own, as the floor of eastern Apalachee Bay is littered with bars and rocky outcrops. If you’re not convinced, take a look at the area south of Palmetto Island on your Florida Sportsman Fishing Chart #012. As an example, this “rock garden” is about 3 miles east of marker #7 in the St. Marks Channel, but if you’re headed there, approach it from the south after turning east along the safe one-fathom line after you pass marker #3A. Staying in safe water another 5 or so miles will get you near the crook in the Big Bend off the Aucilla River. Traveling another 4 miles, at a southeast heading, you’ll find yourself offshore of the Econfina River. Just remember to take it slow and easy when heading towards the “beach”. For the visiting angler, launching at St. Marks is probably the best, and safest, option with regards to getting offshore of the coastline to the east and southeast. In St. Marks, there are excellent ramps at Shell Island Fish Camp, Shields Marina and the public ramp at the confluence. There’s also a good public ramp at Lighthouse Point, near the mouth of the river. 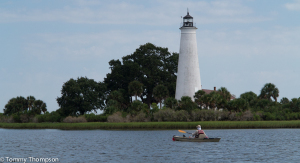 There are public ramps in both dark and rocky Aucilla and Econfina rivers, but tides can be restrictive. If you’re boat’s draft is shallow, launching in either of these two rivers will get you to the fish more quickly. 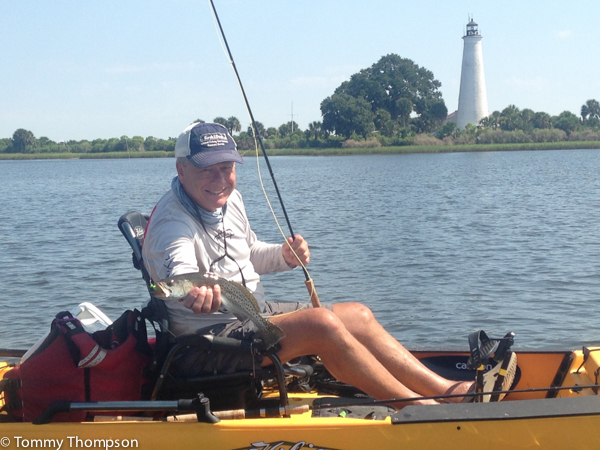 The shallow waters of the upper Big Bend offer perfect habitat for redfish and seatrout. Close to shore, and in the mouths of creeks and bays, you’ll find redfish and big “gator” seatrout cruising, on the hunt for mullet and crabs. On the nearshore grass flats and around old, worn-down, shell bars, expect to find slot-sized seatrout waiting to ambush shrimp, pinfish and white bait. And there are several prehistoric riverbeds that jut into the shallows, each draining the flats and offering sustenance to Spanish mackerel, king mackerel and cobia in late spring and early summer. Those “tongues” of deeper water can be lively on a falling tide. Offshore waters, in this most-northeastern part of the Gulf of Mexico, are shallow, but peppered with rocky outcrops that were at one time, eons ago, high-and-dry. As a result, the rocky offshore fishing grounds here don’t get deep very quickly, so expect to travel at least 15 miles from shore before you mark any 30-foot depths. For all intents and purposes, the farther south and west you travel from big-boat-friendly St. Marks, the deeper the water and the better the chance for reef species.